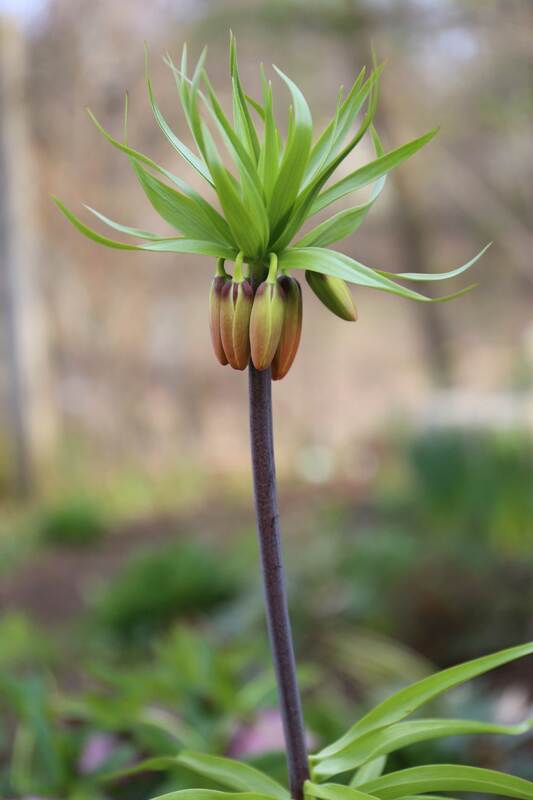 I wish it hadn’t taken me so long to grow Fritillaria imperialis. I guess I thought these exotic-looking flowers would be difficult. But now I can tell you: exotic they are, but difficult they’re not. 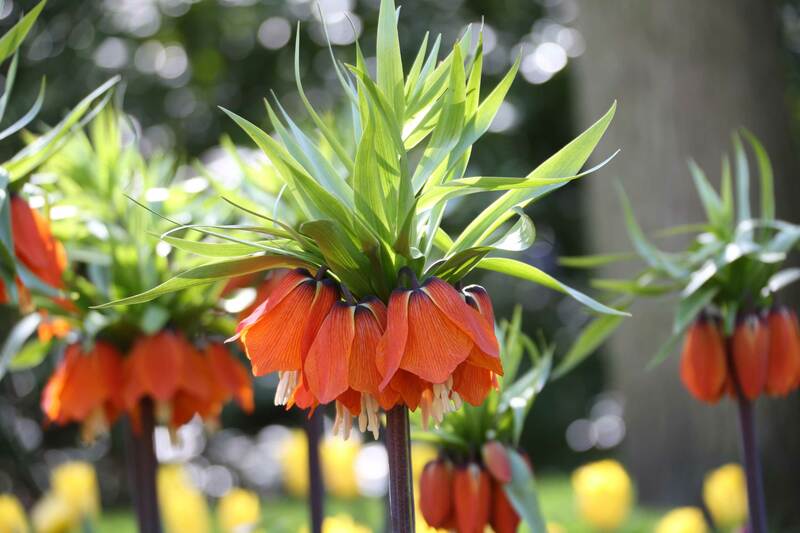 Here are a few things to love about Fritillaria imperialis, also known as crown imperial or pineapple lilies. When you see this bulb’s foliage, it’s pretty obvious that it’s in the lily family. You can also tell by looking at the bulbs. They have scales like a lily bulb, but the scales are fused rather than being loose. The bulbs are also almost twice the size of a regular lily bulb and much heavier. When handling the bulbs, you’ll notice they have a peculiar smell. All parts of the plant emit this same slightly skunky odor. It’s what makes Fritillaria imperialis distasteful to garden pests including rabbits, voles, squirrels, and deer. Of course, the most distinctive thing about Fritillaria imperialis is the flowers. Each bulb produces one perfectly straight, glossy black stem. On top is a crown of bell-like flowers and a crazy hairdo of foliage. Though the plants aren’t particularly tall (30-36″), their unusual appearance makes them an un-missable feature in the garden. Crown imperials usually begin blooming in mid-spring, right after peak daffodil season. Every part of the show is entertaining — from bud to bloom — and the long-lasting flowers guarantee weeks of enjoyment. 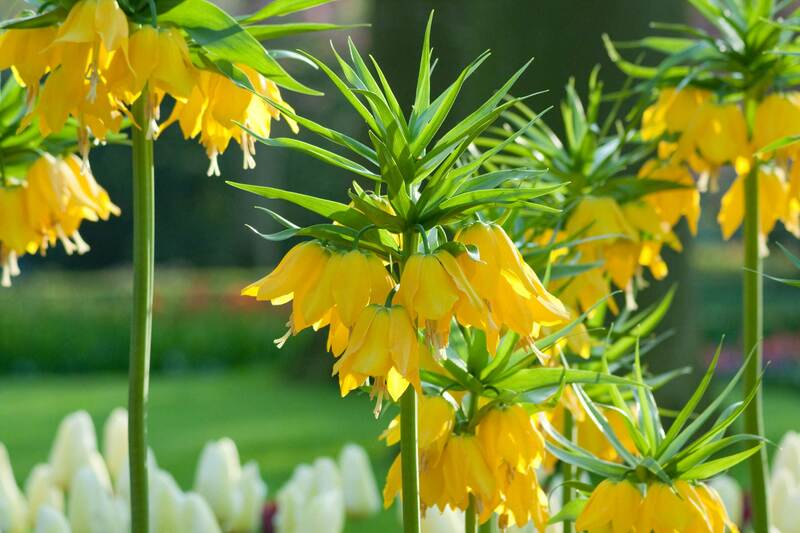 The two most commonly available species of Fritillaria imperialis are Rubra maxima, with orange flowers, and Lutea maxima, with bright yellow flowers. Plant the bulbs in well-drained soil. Fritillaria bulbs have a hole in the top of the bulb (see photo above). Unfortunately, this is a perfect place for moisture to accumulate and it makes the bulbs susceptible to rot. For this reason, it’s particularly important to plant them in well-drained soil. As a precaution, you can dig a slightly deeper hole and put several inches of sand under the bulb. Another option is to plant the bulb on its side so water can’t pool in the hole. When the stem emerges from the bulb, it will head for the sun and grow as straight as it would have if planted upright. Give them sun and warmth. Fritillaria imperialis prefers full sun, but, as with most spring-blooming bulbs, it will also grow in partial shade. Full sun will give the bulbs the best chance of perennializing. Crown Imperials are usually rated as winter hardy in zones 5 and warmer. So far, they have managed to survive winter my zone 4 garden, so I’m planning to add more. As a precaution, I’ll cover the area with 4-5″ of shredded leaves for extra insulation. 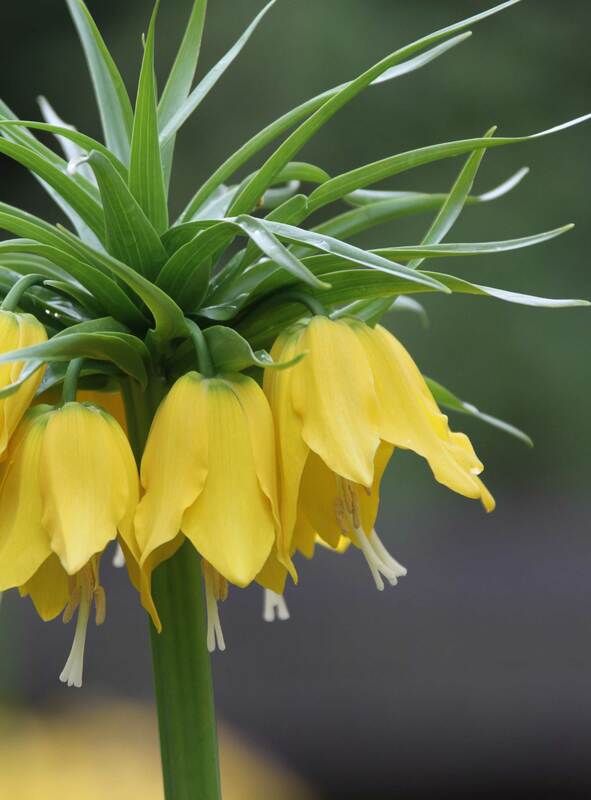 Ideally, Fritillaria imperialis bulbs should spend the summer in soil that is warm and dry — similar to conditions in the plant’s native habitat of Afghanistan, Turkey, Iran, Iraq, and Pakistan. The soil in my garden (wet and cold) couldn’t be more different. So I may find that I need to replant bulbs each fall, as I do with tulips. Plant the bulbs in early fall. Tulip and daffodil bulbs have an outer “tunic” that helps keep the bulb from drying out. 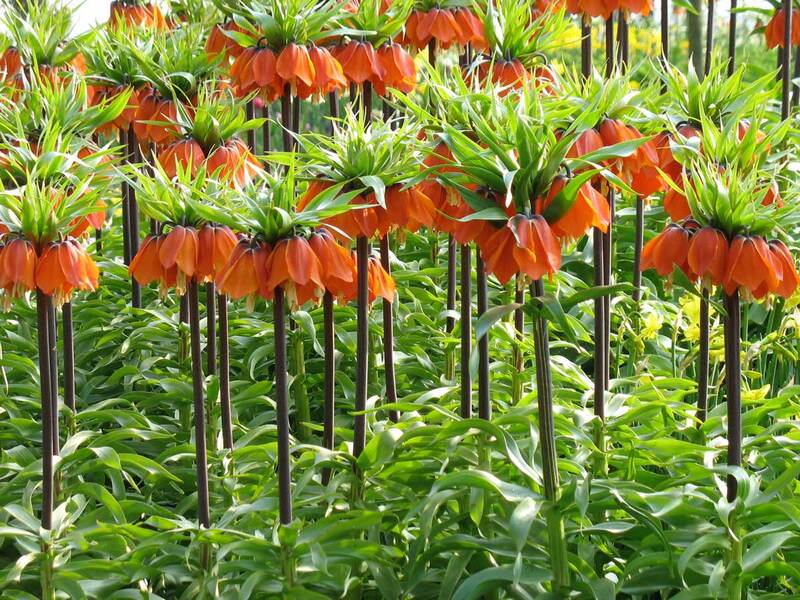 As with other bulbs in the lily family, fritillaria lack this protection. 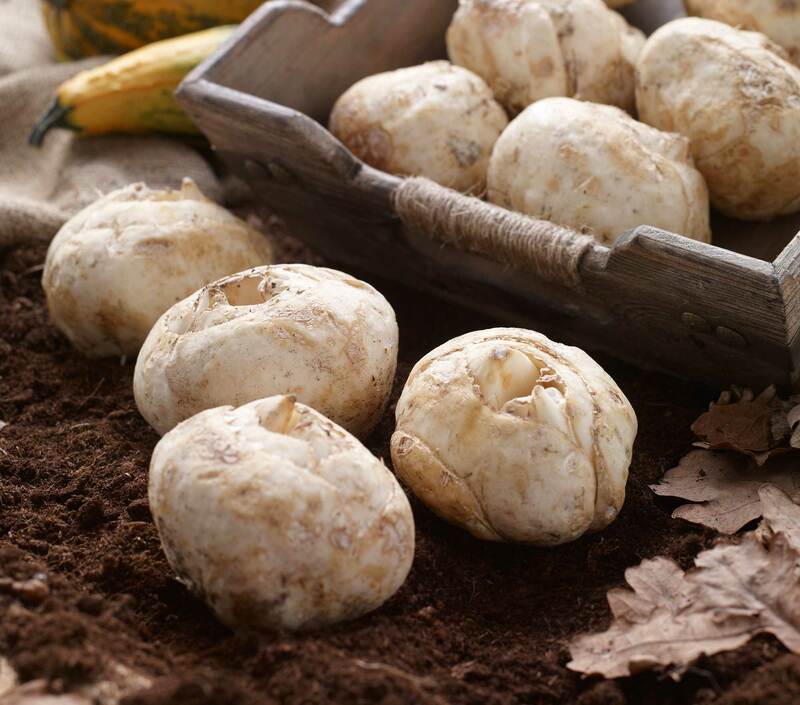 Since they’re more perishable, it’s best to purchase the bulbs in early fall and plant them immediately. Here’s one other thing to know about fritillaries. In any given batch of bulbs, a percentage of them will be “blind.” These are bulbs that come up and produce foliage but do not produce a flower. It’s not about the size of the bulbs. It’s just an annoying characteristic. And, unfortunately, there’s no way to know ahead of time which bulbs won’t bloom. Just plant a couple extras so you’re not disappointed.